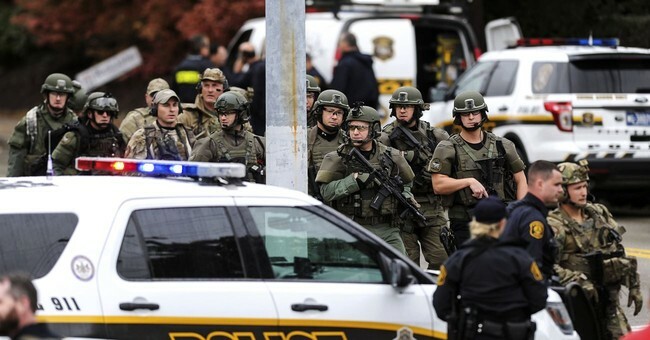 America was reminded today that evil walks amongst us as an apparent anti-semitic mad-man opened fire on a synagogue during a holy celebration in a vibrant neighborhood of Pittsburgh, killing at least 8 and injuring more. The tragedy occurred at the Tree of Life Synagogue in Pittsburgh’s Squirrel Hill neighborhood during a Jewish bris, a circumcision ceremony that is supposed to be a joyous occasion as new parents welcome and name their sons and daughters into the faith. Instead, a clearly disturbed individual bombarded the sanctuary and announced "All Jews must die," before shooting into the crowd. When police arrived, the insidious individual turned and opened fire on authorities. His social media presence shows that he clearly hated the Jews and hated anybody who supported Israel or did not believe in his twisted worldview. For this author, his name will not be broadcast as he is a coward and deserves punishment to the fullest extent of the law, not attention from the media. The suspect is in custody and it is believed he acted alone. Those onsite described it as "a very horrific crime scene” and a gruesome, tragic experience. Dozens of public figures and elected officials expressed their condolences, thoughts, and prayers via social media and television. This is an absolute tragedy. These senseless acts of violence are not who we are as Americans. My thoughts right now are focused on the victims, their families and making sure law enforcement has every resource they need. My God #TreeofLife synagogue in #Pittsburgh is the loving, dignified place where my sister and I attended, and our parents taught, Sunday school; where I was bar mitzah; where my sister wore to class a velvet jumper my mother made; the deep Jewish roots of my own tree of life. My heart goes out to the families of those killed today in Pittsburgh, & to the brave officers who risked their lives to protect others. The attack on the Tree of Life Synagogue was a horrific act of evil. We must recognize this hatred for what it is, & come together to fight it. Coverage will continue on Townhall throughout the weekend.